View this sample resume for a flight attendant, or download the flight attendant resume template in Word. The right resume can really help your career as a flight attendant take off, says resume expert Kim Isaacs. The sky’s the limit, after all. 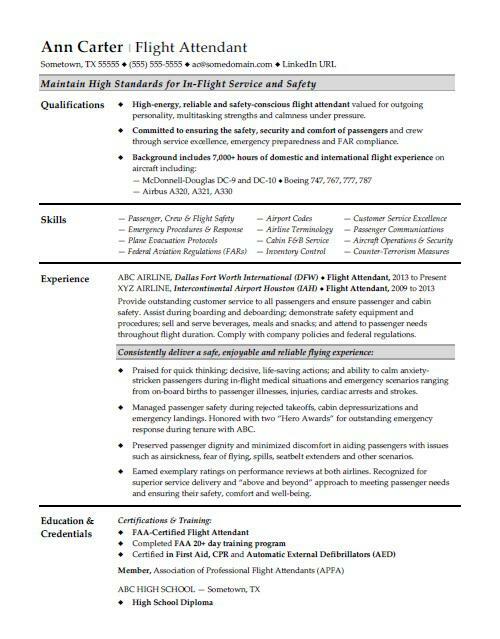 For resume writing tips, view this sample resume for a flight attendant that Isaacs created below, or download the flight attendant resume template in Word. Jobs for flight attendants are projected to grow by 10% (or 11,900 jobs) from 2016 through 2026, which is faster than average, according to the Bureau of Labor Statistics (BLS). If you want to go where the jobs are, you'll find the highest level of employment for this job in the following states: Texas, California, Illinois, New York, and Florida; and in the following metropolitan areas: Chicago; New York City; Los Angeles; Fort Worth, TX; and Houston. In terms of salaries, you can expect to earn a median wage of $50,500 per year, as a flight attendant, according to the BLS. Additionally, you can search for flight attendant jobs on Monster. High-energy, reliable and safety-conscious flight attendant valued for outgoing personality, multitasking strengths and calmness under pressure. Committed to ensuring the safety, security and comfort of passengers and crew through service excellence, emergency preparedness and FAR compliance. Provide outstanding customer service to all passengers and ensure passenger and cabin safety. Assist during boarding and deboarding; demonstrate safety equipment and procedures; sell and serve beverages, meals and snacks; and attend to passenger needs throughout flight duration. Comply with company policies and federal regulations. Praised for quick thinking; decisive, life-saving actions; and ability to calm anxiety-stricken passengers during in-flight medical situations and emergency scenarios ranging from on-board births to passenger illnesses, injuries, cardiac arrests and strokes. Managed passenger safety during rejected takeoffs, cabin depressurizations and emergency landings. Honored with two “Hero Awards” for outstanding emergency response during tenure with ABC. Preserved passenger dignity and minimized discomfort in aiding passengers with issues such as airsickness, fear of flying, spills, seatbelt extenders and other scenarios. Earned exemplary ratings on performance reviews at both airlines. Recognized for superior service delivery and “above and beyond” approach to meeting passenger needs and ensuring their safety, comfort and well-being. As a flight attendant, you know how important it is to be prepared and look professional. Now apply the same strategy to your resume. Could you use some help? Get a free resume evaluation today from the experts at Monster's Resume Writing Service. You'll get detailed feedback in two business days, including a review of your resume's appearance and content, and a prediction of a recruiter's first impression. Let the experts at Monster help your career get off the ground.